Sheep Producers Australia (SPA) is responsible for oversight of the levy investment and for advising the Minister of Agriculture and Water Resources on the levy rate and distribution. SPA works daily to ensure levy investment is clearly directed and that producers’ best interests are met through the provision of RD&E, services, programs and marketing. The Australian sheep and lamb industry provides premium products to domestic and international consumers and has a hard-earned reputation for fresh, safe and nutritious lamb and sheepmeat. 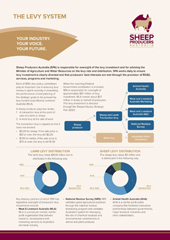 Sheep Producers Australia (SPA) represents and promotes the interests of sheep producers to government and industry to position the Australian sheep and lamb sector for future success. 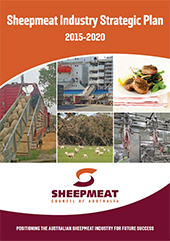 The Sheepmeat Industry Strategic Plan 2015-20 (SISP 2020) sets out the sheepmeat industry’s strategic priorities for the coming five years. The plan has been developed with a focus on 2030 – because certain important decisions to be made now will only start to exert a major influence some years after the life of this plan.